I used to go to Vivo City Mall to" Food Republic" where they had excellent "Thunder Tea Rice " (Lei Cha Fan) a Hakka dish invested with a hundred years of history. As I remember, there was another outlet at Suntec City Mall. I would always check out the Food Republic where Thunder Tea Rice was sold. I would have mine and take some home for Floyd if he was not with me. The first time I had it at Vivo City I fell in love with it. I love green tea and all the vegetables they use with brown or white rice . I am not Chinese and do not know what ingredients are supposed to be in the authentic recipe - how many green leafy veggies, beans, some say 7 some say 5, or what kind of tofu was used. Whatever it was, it was fabulous and I devoured it. Recently we happened to be at Vivo City and I made an effort to go and have my favourite Hakka specialty, but unfortunately it was just awful. The tea soup was as if it was made with sewer water. After the first spoon I didn't touch it and the rest of the mixture was inedible. I was disappointed and disgusted. I set out to see if all the other outlets were serving the same thing. They were! The outlet at Lau Pa Sat was just as bad and I thought maybe it was me, but after asking a few people who had ordered it I found they didn't really enjoy it either. I realized that the quality control that was presented before, perhaps by previous owners or the head chef, was not there any more. I checked out other outlets and it seems they have either changed the recipe or they just don't care. I usually do not write about my bad food experiences, as with food it is tricky as what you don't like others may enjoy. Maybe the chef was sick or they didn't get the right vegetable on that day, but this was such a let down and it was across the board that I have to voice my disappointment. 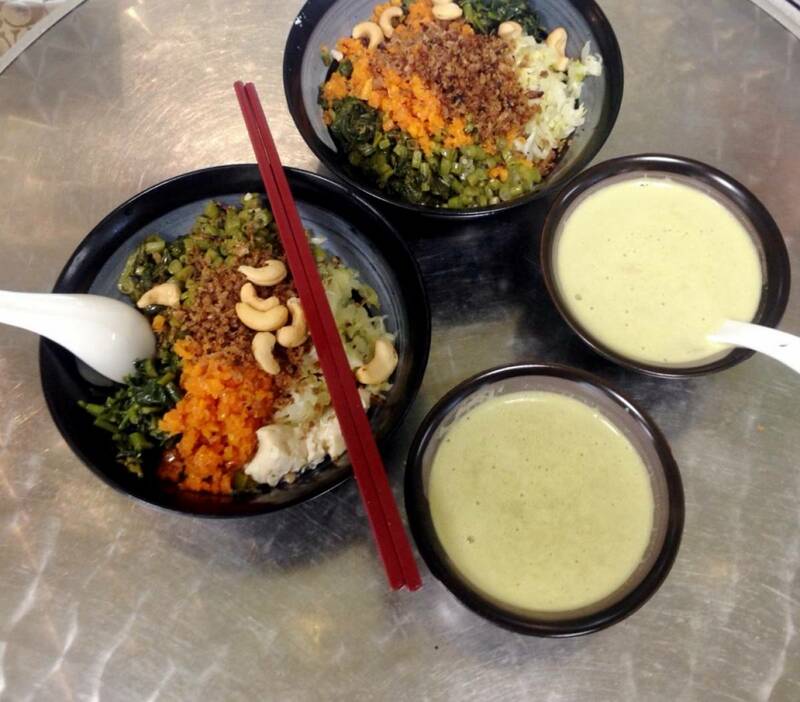 On the bright side If you love thunder tea rice with green tea soup the best place to have it now is at Tracy Juice Bar, at Fortune Centre in Bugis. I say the BEST EVER , creamy, frothy and full of flavour. The brown rice comes with lots of healthy nutritional ingredients. It is just heaven! I am hoping it will always stay true to its recipe, keep its high standards and don't let them flag as the other outlets have done. My friend Mag and I usually introduce new places to each other and go out of our way to try good healthy hawker food in Singapore. Thunder Tea Rice at Tracy's is not cheap as hawker food goes, but worth every penny. Tarts - What's All the Fuss About?